← Where’s Marcel? – Great Vibe & Super Friendly! Pop Up Scroll – Bringing Scrolls Back Into Fashion! 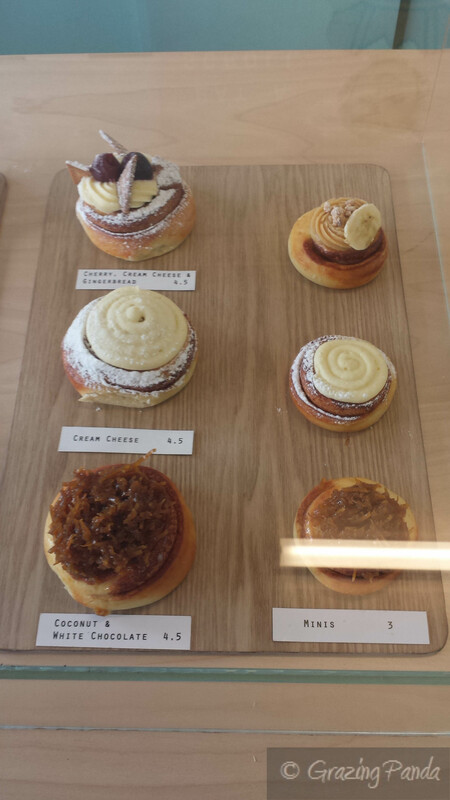 Amongst the entire Doughnut, Cronut, Dossiant, Cruffin hype comes the latest craze – SCROLLS! Enter Melbourne’s first new scroll boutique – Pop Up Scroll – located in Smith Street, Collingwood. Serving up freshly baked swirls of goodness made each morning alongside some delicious, carefully prepared coffee – which has been supplied by Coffee Supreme. Coffee and scrolls – a perfect combination to kick off your early morning start or for an afternoon treat. Pop Up Scroll was created by trained cook, baker and now full time pastry chef Julian Chew together with his wife Tammy Chew. They are both not new to the food industry, having previously owned the popular Lip Café in Ivanhoe. Julian has previously apprenticed under Matt Moran (of famed restaurant Aria) and done stints at Loafer Bread and Da Noi – firmly cementing his niche as a pastry chef. Here, the focus is on coffee and scrolls only and they do it very well. The idea came about when Julian used to prepare Cinnamon and Cream Cheese scrolls for his former café and he was finding that he would be selling out of these delicious goodies on a regular basis. People would come from near and far to sample these tasty scrolls. Due to its increasing popularity both Julian and Tammy thought it would be a good idea to expand the concept and invest in this idea further – and Pop Up Scroll was born! Pop Up Scroll has a philosophy to take customers back to their childhood by producing beautiful, fresh scrolls in unique flavour combination by utilising some of the lost arts of cooking. Each scroll is made using techniques that Julian has learnt throughout his impressive fine dining pastry training and is made free of any chemicals and additives, and with the use of organic ingredients. Eat a Scroll bake two batches of scrolls daily – one in the morning for the pre-work rush and another in the afternoon for the afternoon tea & coffee crowd. 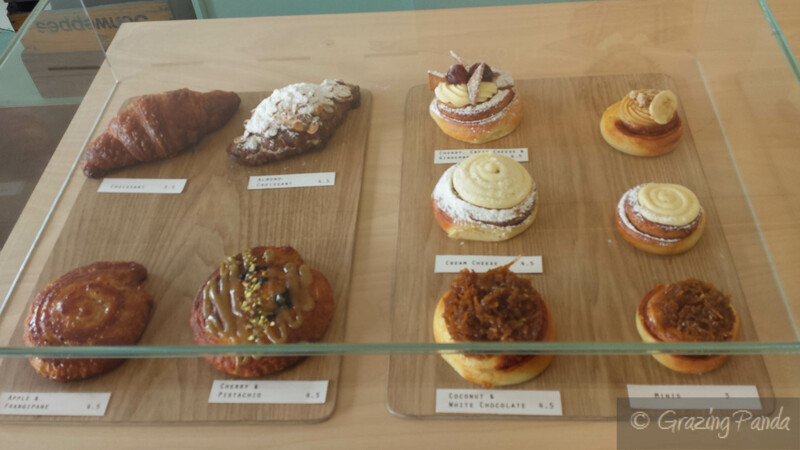 Currently there are six different flavours on offer – Traditional Cinnamon Bun with Cream Cheese Frosting, a Malaysian inspired scroll of Shredded Coconut and White Chocolate, Peanut Butter and Banana, Chocolate and Caramel as well as a Chocolate and Custard flavour – all of which are on a brioche base. The brioche base scrolls come in two sizes – large and mini – with certain special flavours available as well – the day that I went there was the Cherry, Cream Cheese & Gingerbread. 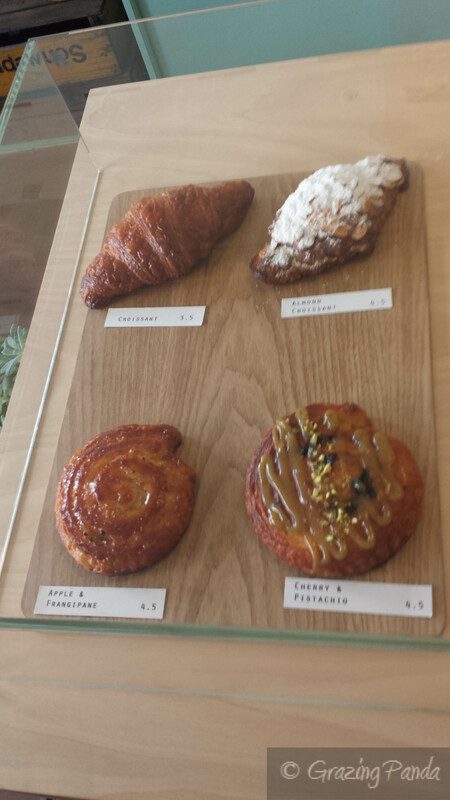 There are also flavours available that are baked using a croissant base (similar to an escargot) – these are Pistachio and Cherry or Apple and Frangipane, Traditional croissants and almond croissants are also available for your eating pleasure. There are the traditional coffees available as well as Affogato, Ice Coffee and House Blend Chai (which can be served Hot or Iced) served with Bonsoy & Coconut Milk if needed. The vibe is blissfully charming, complete with a retro fit-out. I love the pastel shades that are used along with cute retro style girl and boy doll decals on the main wall, together with the words EAT A SCROLL and DRINK COFFEE. Simple yet effective styling. There are two mint green cabinetry units – one which displays packets of Callebaut Chocolate and King Island Coconut Milk Creamer, along with coffee cups and the other displaying Parker’s bottled drinks – Ginger Beer, Cola etc along with an old school radio. There is minimal seating available (seats around 15 people)– in the form of small round tables, as well some seating along the window, overlooking the main street. The simplicity together with the playfulness works well together. When it came to ordering I decided to order a mini original cinnamon and cream cheese scroll and was tempted into getting the Gingerbread, Cherry & Cream Cheese scroll as well. I mean just have a look at the picture – how can you say no? I had the mini original scroll as well as a latte to eat in and decided to take the bigger scroll home for later. The coffee was delicious – creamy, nutty and strong all at the same and really did make my day. The scroll was absolutely divine – the dough is moist, light and fresh and is of the perfect sweetness. The cinnamon flavoured rolls are topped with cream cheese frosting and infused with cinnamon and brown sugar. It really does feel like you are biting into the softest pillow and are light and airy, allowing you to have more than 2 and still keep you wanting more. You really need to try one to understand the pure indulgent feeling you get. 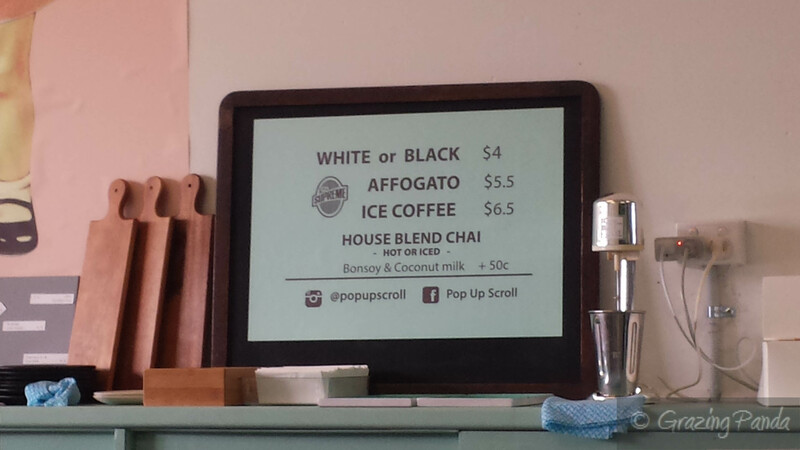 Pop Up Scroll is a great addition to not only the Collingwood area but to Melbourne in general. They bring together the simple concept of sentimental baking together with great coffee and delicious, light fluffy scrolls. One visit here and you will definitely be coming back for more. As the name suggests, Pop Up Scroll is only around for a short time (until May 2015) but there are already big plans in the pipeline for the next project due to open straight after the pop up closes its doors. EAT A SCROLL will be located just around the corner from the current location and will be a more permanent scroll house. Atmosphere / Ambience: Charming, Classic, Retro and Welcoming. Standout Dish: Seriously any of the scrolls!